Note: This same process can be used to cut a honeydew or any other similar melon. You may also like my tutorial on how to cut a watermelon here. First you want to start with a good, ripe cantaloupe. You don’t want to see any external spots or squishy spots. 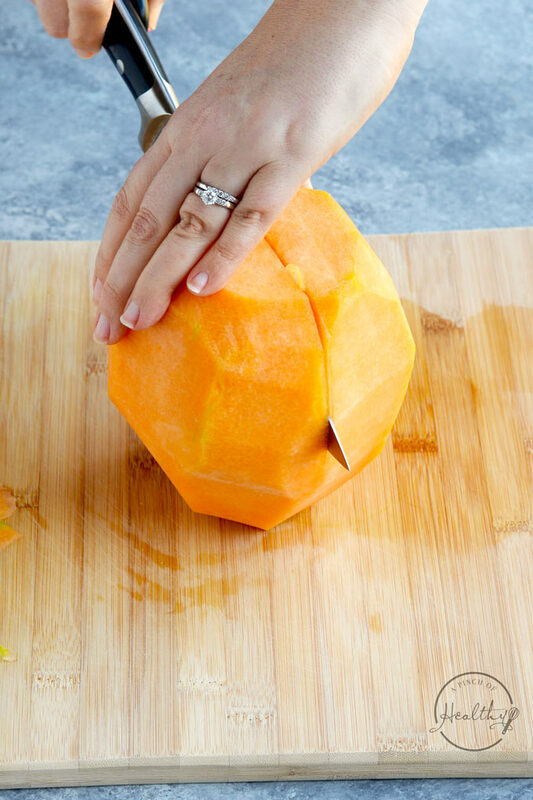 When a cantaloupe is ripe, it will have a slight give when you press your finger on the exterior. 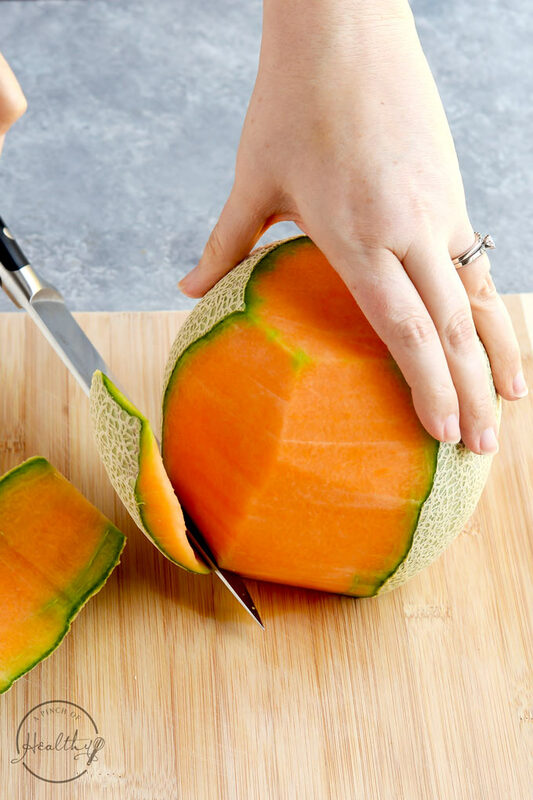 This makes it easier to peel and cut a cantaloupe. Also, be sure and rinse your cantaloupe off to help remove any dirt and/or pesticide residue. A fruit and veggie wash may be used, if desired. I personally love the Young Living fruit and veggie wash myself! And a good, sharp chef’s knife works best. First, I start by cutting off both stem ends. The stem ends are where you can see a little spot from where the cantaloupe was growing on the vine, as shown below. This helps to create a flat, secure base for peeling. So after you have cut off both ends, turn the fruit up on one of the flat sides. Then, take your knife and carefully use a downward cutting motion, almost in a C shape, to remove the skin. Just keep rotating the fruit around until you have removed most of the skin/ peeling. Don’t worry if some green strips remain. You can go back and use my knife to go back around and clean those up. 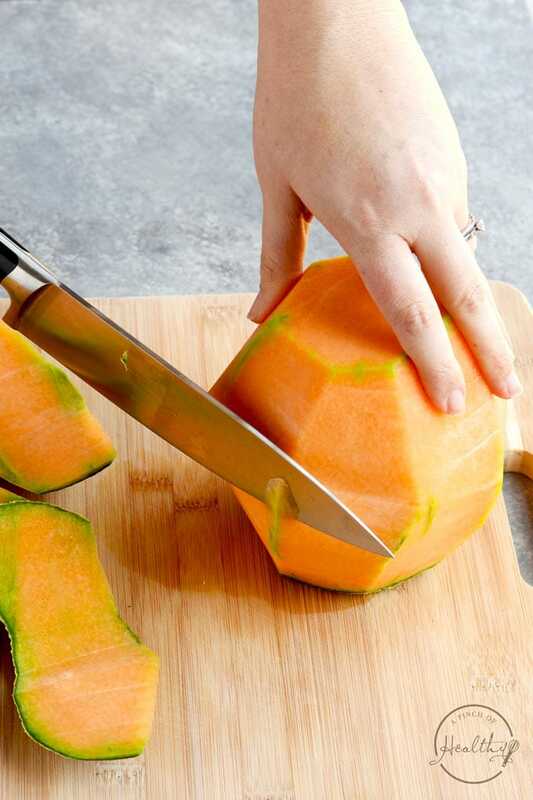 Now you are ready to cut the cantaloupe in half. Leave it sitting on that flat base, just like when you were peeling, and cut straight down the middle. The seeds will be exposed. These are super easy to remove! Use a spoon to scrape around the seeds and the membranes. This loosens things up. And then use that same spoon to remove the seeds. Now you are ready to pick what shape slices you want. Thin slices look nice, are easy to serve and they can stretch a cantaloupe to feed a lot of people. They look pretty on an assorted fruit tray with all kinds of fruit. First, turn the cantaloupe hollow side down (where the seeds were). You want those flat stem ends to be from left to right, as shown in the picture below. You are going to carefully slice thin slices in the same direction you sliced off those stem ends. It doesn’t have to be perfect, but try to cut similar width slices. 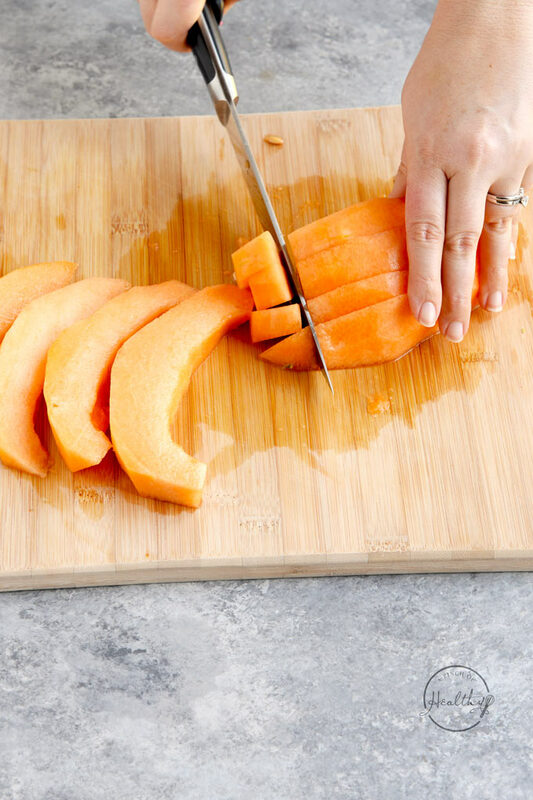 Once you get to the end, you can use your knife as a scoop to transfer the fruit to a serving plate or tray. Just place them centered to where you want them. 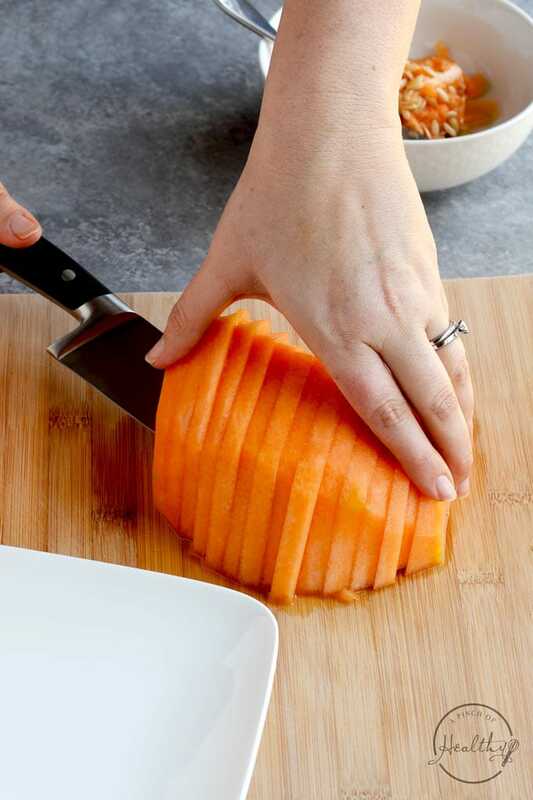 Then you can use your hands to gently press down to kind of fan them out, and they will spread a little to look like a pretty cascading stack of cantaloupe slices. 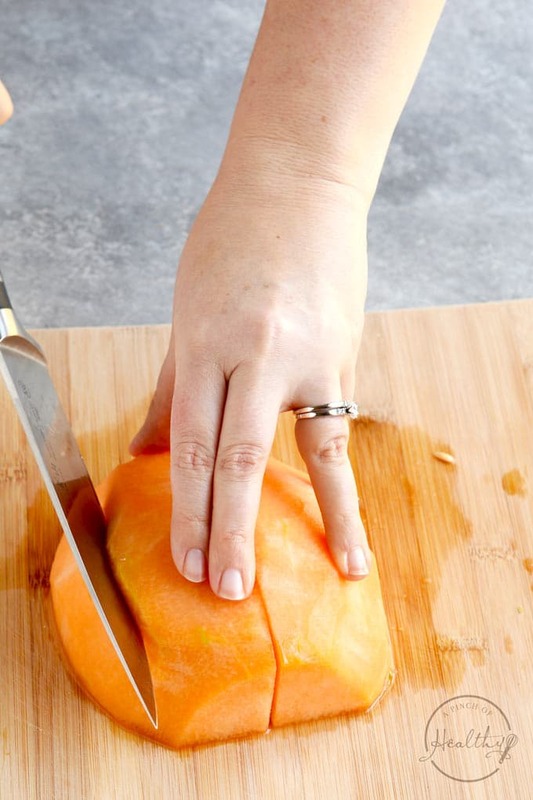 Tongs are very useful for serving cantaloupe slices like this. 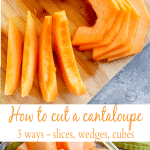 I am using the other half of that same cantaloupe to show you how to cut cantaloupe wedges. So take your cantaloupe half and lay it hollow side down on the board. But this time you want those flat stem ends facing top to bottom, as shown below. I will show you how to get 8 wedges from this cantaloupe half (16 wedges, if you cut the whole cantaloupe this way). Cut this into two equal pieces. Then cut those halves in half. I try to angle my knife slightly toward the center of the cantaloupe, at about a 45 degree angle. Do this on both sides to give you 4 equal chunks. And then cut all remaining pieces in half again to give you 8 total wedges. Again, it helps to angle that knife toward the center of that stem end. 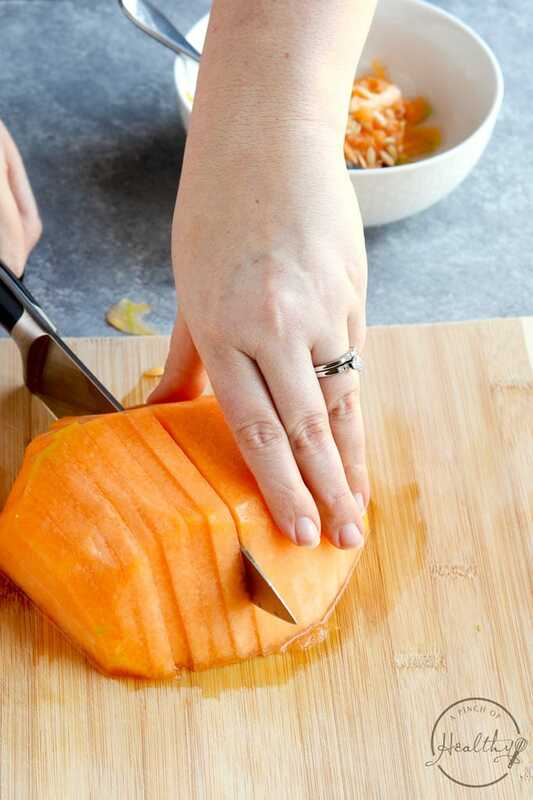 First, complete all steps in the above section, how to cut a cantaloupe into wedges. Next, take 4 of those wedges and turn them horizontal to yourself, with that hollow side down. Use your hands to kind of squeeze them (gently) to hold them together. Carefully make perpendicular cuts (like a checker board). Keep cutting all the way across until you get cubes. Repeat with the other wedges, 4 at a time. I like to store mine in an airtight container with a lid. Keep it in the refrigerator once it has been cut and peeled. 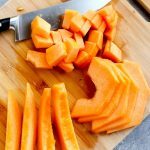 How long is cut cantaloupe good for? We usually keep ours for about a week, if it lasts that long! I did a quick Google search and confirmed it should be good for 4 to 7 days in the fridge. 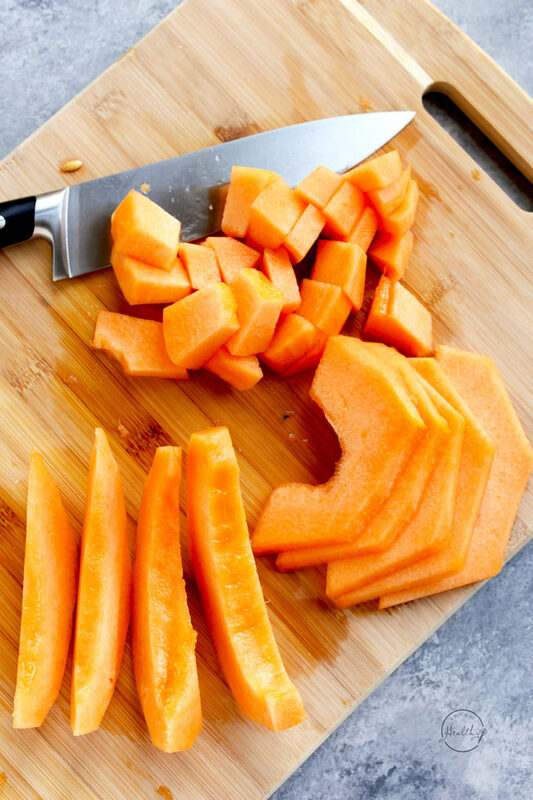 Here is how to cut a cantaloupe 3 different ways - thin slices, wedges and bite-sized cubes. First, I start by cutting off both stem ends. The stem ends are where you can see a little spot from where the cantaloupe was growing on the vine. Turn the fruit up on one of the flat sides. Then, take your knife and carefully use a downward cutting motion, almost in a C shaped curve, to remove the skin. Keep rotating the fruit around until you have removed most of the skin/ peeling. Go back around and use your knife clean up any little remaining fragments from the peeling. Leave it sitting on that flat base, just like when you were peeling, and cut straight down the middle. Use a spoon to scrape around the seeds and the membranes. This loosens things up. And then use that same spoon to remove the seeds. Follow instructions for peeling and removing seeds above. First, turn the cantaloupe hollow side down (where the seeds were). You want those flat stem ends to be from left to right, as shown in the photos above. Carefully cut thin slices in the same direction you sliced off those stem ends. 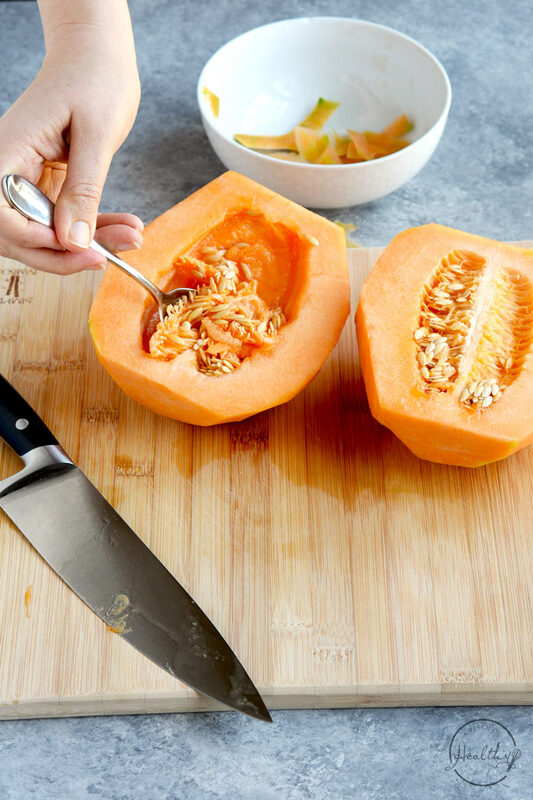 Use your knife as a scoop to transfer the fruit to a serving plate or tray. Place the slices centered to where you want them. 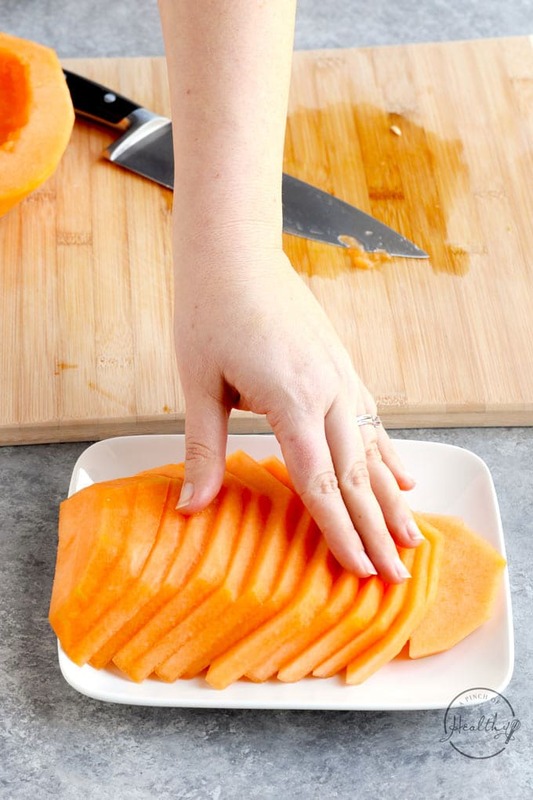 Then you can use your hands to gently press down to kind of fan them out, and they will spread a little to look like a pretty cascading stack of cantaloupe slices. 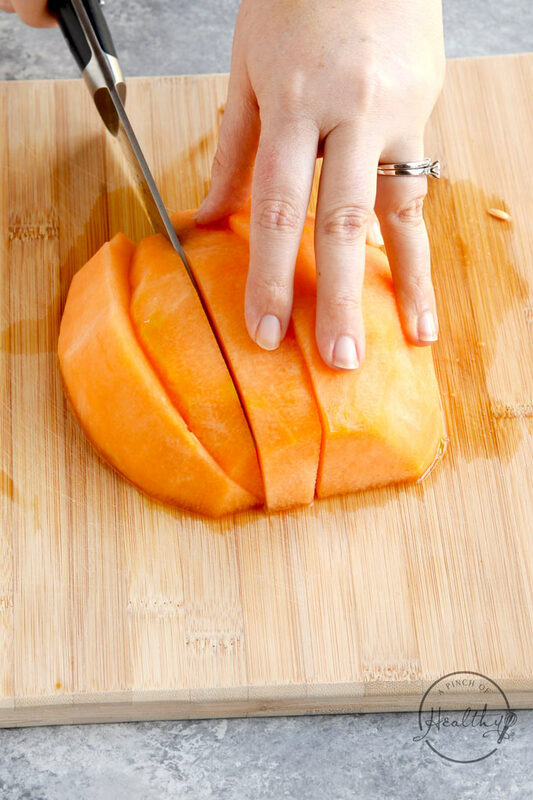 So take your peeled and seeded cantaloupe half and lay it hollow side down on the board. Arrange those flat stem ends facing top to bottom, as shown in the photos above. Cut this half into two equal pieces. Then cut those two pieces in half. 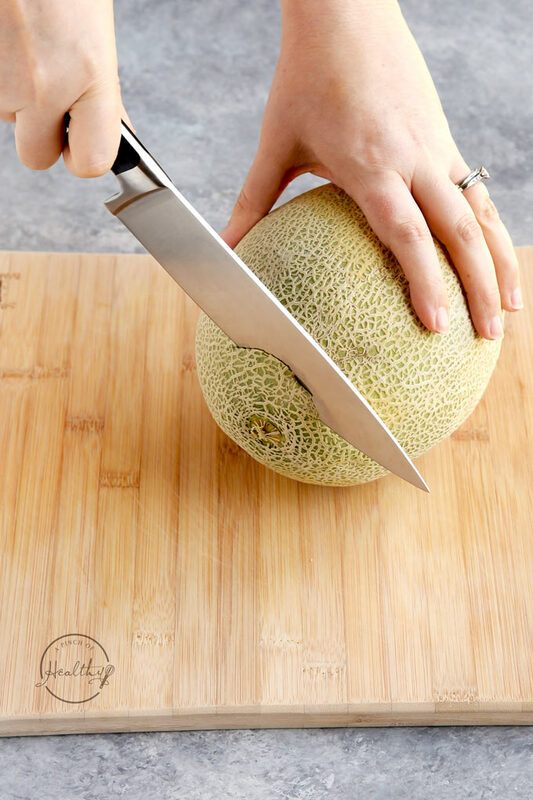 Angle your knife slightly toward the center of the cantaloupe, at about a 45 degree angle. Do this on both sides to give you 4 equal chunks. Then cut all remaining pieces in half again to give you 8 total wedges. Again, it helps to angle that knife toward the center of that stem end. Repeat on the other cantaloupe peeled and seeded cantaloupe half. Follow instructions above for peeling, seeding and cutting into wedges. Take 4 of those wedges and turn them horizontal to yourself, with that hollow side down. Use your hands to kind of squeeze them (gently) to hold them together. Carefully make perpendicular cuts (like a checker board). Keep cutting until all of your wedges are in cubes. Store in an airtight container for 4 to 7 days in the refrigerator. A good, sharp chef's knife works best. 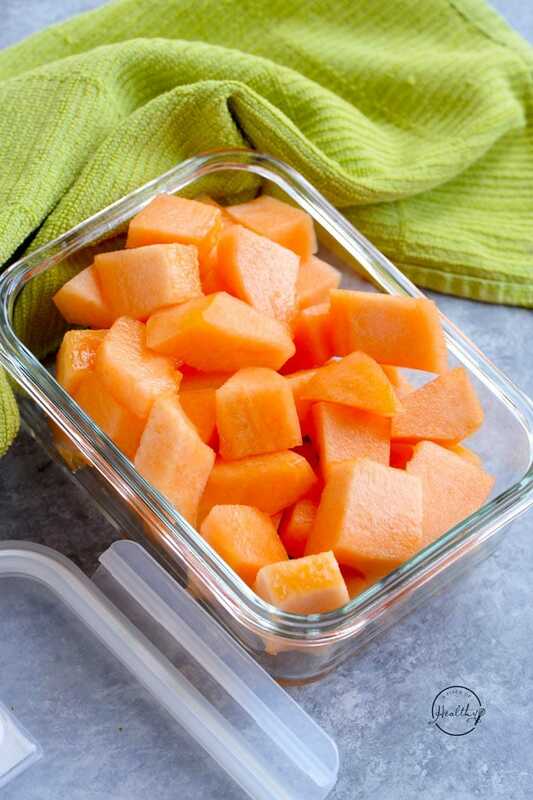 A ripe cantaloupe will give a little when gently pressed. 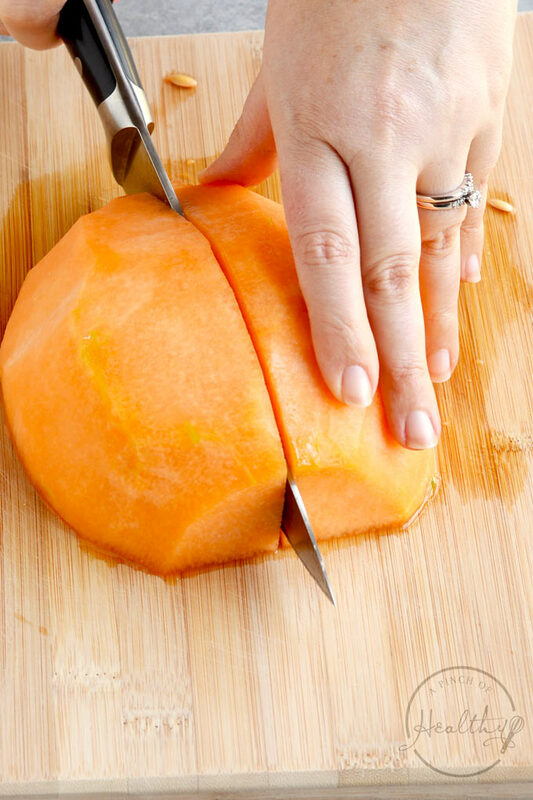 See all photos above for visual help in how to cut a cantaloupe. Love this! So simple, and yet so useful.